Inky Fairy Designs: This Creeper sure isn't blushing!!! Seriously, isn't she awesome? I love her!!! She was perfect paired with this Cosmo Cricket the boyfriend paper kit. Whenever I reach for my creepers, I tend to go a little wild and out of the box with the hair color. She is colored with copics and her hair is with R81, R83, R85, V99 with a touch of BV00, BV02, BV01, BV11. I have had a lot of comments asking about how I do the white highlights & if I use a gel pen.....I will gladly share my secrets with all you TGF Fans! 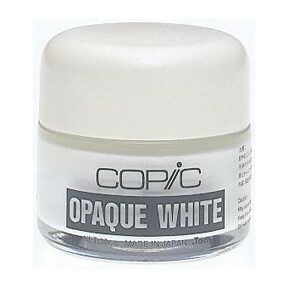 I am actually using Copic Opaque White to do the highlights. I seriously LOVE this stuff. It is a thick acrylic water-based paint that I use with a very fine tip paintbrush where I want to add just a bit of highlight or texture depending on how thick I apply it. If I'm adding highlights, I will put a dab of it on a paint tray and mix it with a bit of water - this gets it to an ink-like consistency great for highlights. If you apply it thicker from the bottle, I have found that it dries a bit raised for added texture which is really cool! That's it for me today, but we sure do hope you'll stop by the TGF Blog tomorrow, beginning at 12:01 am CST for our"BLUSHIN' into SUMMERTIME" DT Blog Hop/Release Party. The ENTIRE JULY RELEASE will be up for grabs (and this is One HUGE release!) as well as some prizes and SUR-prises going on around our Facebook page, etc.... we definitely don't want you to miss a single minute of the FUN that we have in store for you, so we can't wait for you to join us then! Don't forget to stop by the Farm Fresh Challenge Blog tomorrow for another awesome "Throwback Challenge" too! As new meets old, there is a TON going on this month on the Farm...thanks for being a part of it and ENJOY the HOT new releases tomorrow...all SIX of them!!!! This card is awesome! I love everything about it. Thanks for sharing it! Fabulous Carisa! I love her hair and I love that quote, just Fantastic! What an Awesome card Chickie! Cool card sweetie!! Love your coloring!! First! Love the name Piper! She just has this 'tude that makes you love her, doesn't she! Love the hair! Carisa, LOVE the card and your colouring is just AMAZING! I LOVE Piper..she's SO sassy and she looks so AWESOME with the hair colour you chose! This is awesome - your coloring is just stunning and the card is so cute!!! Very very cool Carisa! I love the sentiment on this... that is too fun! LOVE the white highlight tip as well. THANKS!! This sentiment is FANTASTIC! Totally looks like that's what Piper is thinking! hahahah Love all the layers and your coloring on her clothing looks amazing! Great card! I know a few teens who this card would be perfect for! hahahahaha!!!! I love your Piper! And the boyfriend paper is a perfect choice. But the hair color is awesome!!!!!! Thanks for the opaque white paint tip. You have a dangerous blog, i could spend all day here. Reading your list of supplies, the copics made me laugh and i was trying to figure out the washi tape...is that the green in the background, i've not seen it that wide so i wondered. Cool Funky card!! That sentiment is just to funny and it def suits Piper. Welcome to the Farm! Happy to be a new follower!! Ps. Thanks for the Copic white paint tip. 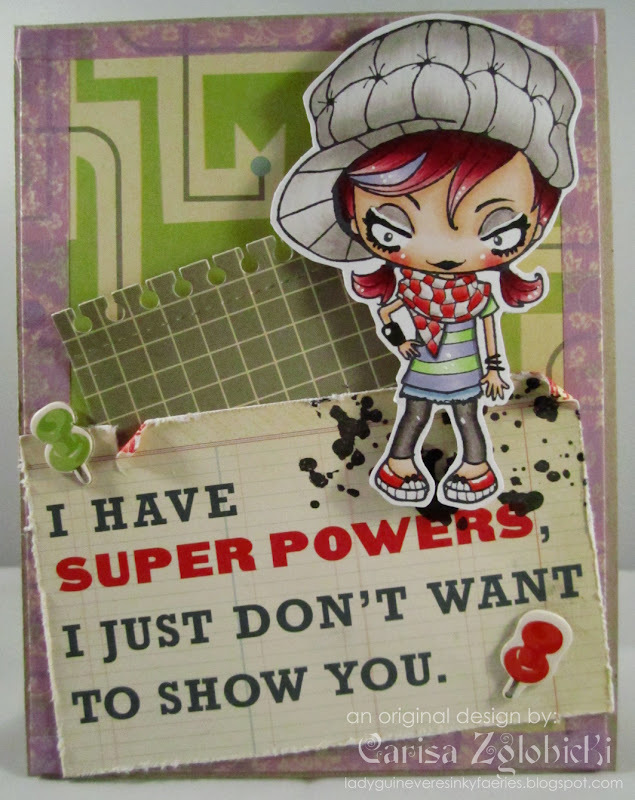 I just love this card and the saying you have with it is super adorable. I always enjoy looking at your work of art and look forward to seeing your future creations. I hope you have a wonderful weekend.